If it rains at your house, you need a gutter system. Gutters prevent water damage from the roof to the basement. One type of gutter that is gaining in popularity is copper gutters. At Custom Insulation we believe copper trumps the rest. Copper gutters will never rust or rot away; whatever the weather this gutter will withstand it. Copper gutters add a distinctive style and flare to your house which is different than your standard gutters. Their style is noticeable and recognizable and they add a visual appeal that can only be accomplished with copper. Because it is more valuable, copper adds a higher value to your home. Also, they are more easily maintained than aluminum or vinyl. Copper gutters will oxidize and turn green over time unless you treat them. There are ways to preserve the shine with sealants, but it is not necessary. And, on the other hand, many people like and prefer the greenish look, particularly in older homes found in Worcester and in other parts of Massachusetts. Copper has an exclusive look. 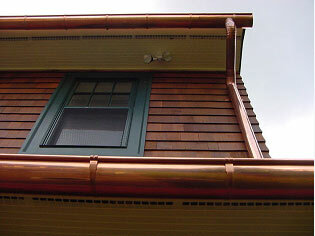 Copper gutters are an excellent addition and investment for the exterior of any home. The many benefits: sustainable building material, cosmetic enhancement and increased home value, and low maintenance; mean that you're going to pay a bit more for copper gutters. The positive side is that you will be getting a product that lasts longer and is easier to maintain. Call Custom Insulation for more information. Besides the convenience of not being dripped on, gutters provide a useful and important function for the maintenance of your home. By channeling rain water to a central downspout and thereby away from your foundation, gutters help to prevent a slow but steady accumulation of moisture around the perimeter of your house. Over time, this can lead to foundation problems, leaks, or wood rot. If you were on the fence about installing gutters, remember that they can also provide added value to your home in more ways that one. If you are installing gutters for the first time or performing gutter repairs, there are a few things to be aware of before you begin shopping. Gutters come in several varieties and materials. Each has its advantages and disadvantages. Maintaining gutters is one issue, then there are cost and aesthetic appeal to consider. 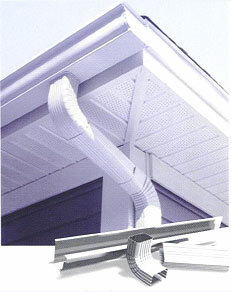 We provide only the best type of gutters for homes, which we will go over in small detail below. Copper gutters are very strong and keep protecting your home for years. Many people choose copper for its visual appeal, as it can add a nice gold or patina piping to your home design. 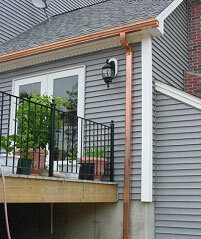 Copper gutters still protect homes from water damage, but look great doing it. There are many sizes available, from a standard 5 inch to much larger commercial grade 8 inch. All copper gutters consist of 16oz. per foot and are made from the highest quality copper available. Aluminum is a cheap install option and will work perfectly fine for several years. We offer seamless gutters in 5 inch and 6 inch sizes. All seamless gutters are made with .032 inch thick aluminum. They are available in a variety of colors with baked on enamel to ensure beauty for years to come. If your house has no gutters or if the existing ones are showing signs of leakage or are pulling away from the house in places, do not let the problem get worse. Whichever gutter you choose to install will add value to your home and prevent future maintenance issues. Contact us today to learn more about our gutters and be sure to check out our insulation methods and other services we offer. It really is essential to have a gutter system especially in the Boston area. Having gutters will prevent all sorts of harm from the roof all of the way to the basement. Rain gutters will prevent costly water damage. One form of gutters we offer that are fairly popular are the copper gutters. Copper gutters are excellent to have for numerous factors such as the fact that they'll never rust or rot away. What ever the weather happens to be, this gutter type will withstand it well. Copper gutters add a distinctive style and flare to your house. Their style is right away noticeable and recognizable. It adds a sense of visual appeal that can only be discovered with copper. It's really more valuable than other materials, and adds an even higher value to your residence. You won't have to maintain them as much as aluminum or vinyl, but they do require some upkeep. The one area you will only want to keep an eye on is with oxidation. Copper gutters will oxidize and turn green over time unless you treat them. There are methods to preserve the shine including by utilizing sealants, but it is not needed. On the other hand many people prefer the greenish look, particularly in older homes made from stone or stucco. There's an exclusive appeal or look to it that's only developed with time. You'll see them on homes that grow ivy as well. All of these features pretty much mean that you're going to pay a bit more for copper gutters. The positive side of that is you might be truly obtaining a product that lasts longer. You will also invest less time maintaining them. Contact us today to learn more about our gutter systems as well as our insulation methods and other fine services.